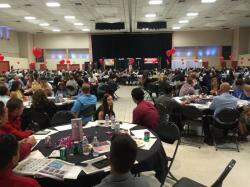 Congrats to all the athletes, coaches and families of the 2016 Yuma Sun/Yuma Rotary Sports Banquet! And many thanks to all the Rotarians who helped make the evening a success! 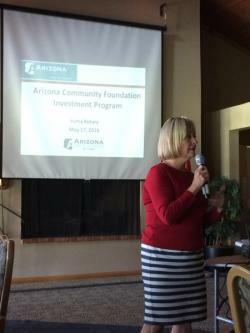 This afternoon's speakers were Shara Merten, Gary Dokess and Jeff Sauter of the Arizona Community Foundation Investment Program. Club Yuma Rotary has opened a foundation fund allowing tax deductible charitable contributions for community projects. 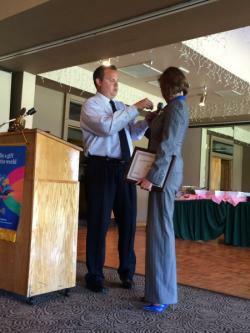 President Adrian and fellow Club Yuma Rotarians proudly inducted Susan Thorpe into our club. 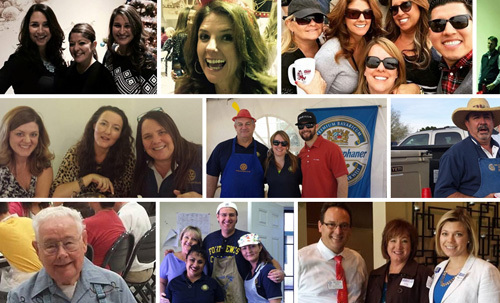 While Susan took over as Yuma County Administrator in February 2016, she is no stranger to Rotary and looks forward to continued service in Yuma. 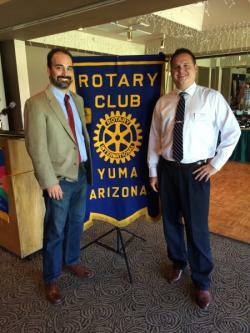 Christian Palmer, Communications Director for the Prop 123 campaign spoke with Yuma Rotarians about challenges Arizona's schools face to retain teachers and bring Arizona's public education ranking up from 50th. Christian explained Prop 123 would be funded from state land trust monies (currently valued at $75B), taking $220M a year over the next 10 years. The state would then allocate the funding for public education, including teacher retention/competitive pay and use towards existing and future litigation. Christian expressed his appreciation for Yuma's legislation and Chamber of Commerce for their support and hopes Yuma Rotarians will vote in support of Prop 123 on May 17th. 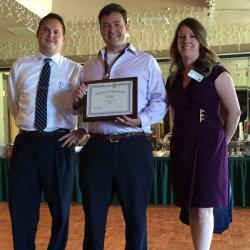 Yuma Rotary proudly inducted Chris Williams this afternoon. 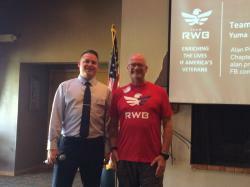 Chris manages the City of Yuma's Civic Center and looks forward to working with fellow Rotarians for the betterment of our community. 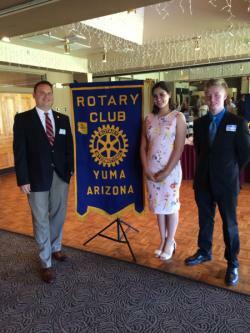 Arizona's JSA Lt. Gov, D'Artangnon Hook of Yuma, and Kofa High School's JSA Chapter President, Gabrielle Varela spoke with Yuma Rotary about how students in JSA are becoming more educated and involved in public speaking and politics. They shared their accomplishments and goals as well as the fact that Yuma has the largest presence of JSA students in the state!! Congratulations to Page Misenhimer for achieving his second Paul Harris award! 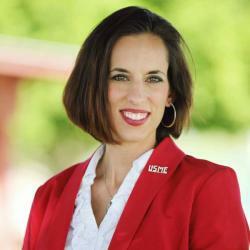 Your dedication to Rotary and the Yuma Community is truly appreciated! 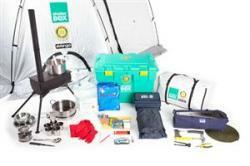 Yuma Rotary donates 2 Shelter Boxes...... What is a Shelter Box? Get live updates and vote totals from the Council on Legislation on Rotary.org beginning on 11 April. The Rotary Foundation and UNESCO-IHE Institute for Water Education are offering up to 10 scholarships for graduate study at UNESCO-IHE's Delft campus in the Netherlands. The aim is to increase the number of trained professionals who can devise, plan, and implement water and sanitation solutions in developing areas. The scholarships also are designed to promote long-term relationships between Rotary members and skilled water and sanitation professionals. Interact clubs are making a positive difference in schools and communities around the world. Leaders of sponsor Rotary clubs and districts should make sure their Interact clubs get the recognition they deserve by verifying that they qualify for a Presidential Citation. 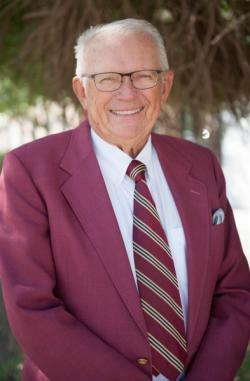 Rotarian Steven Shadle was honored as Arizona Western College's 2015 Hall of Fame Inductee! 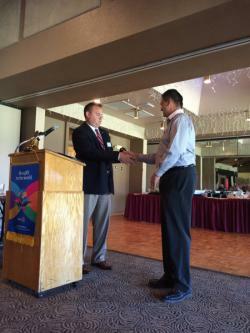 Our Yuma Rotarian Art Morales was recognized as Arizona Western College's 2014 Distinguished Alumnus. The American Business Women’s Association (ABWA) named Dr. Kella Price, SPHR, CPLP, SHRM-SCP, CEO and HR/Training Consultant with Price Consulting Group and Fitness and Nutrition Coach with Kella Price Fitness, one of the Top Ten Business Women of the Year. The Top Ten Business Women of ABWA is a national program that honors 10 outstanding members for achieving excellence in career, education and community involvement.